Oriental red mites Eutetranychus orientalis, from here. The Tetranychinae are a group of spider mites characterised by the absence of tenent hairs on the empodium, or the absence of the empodium itself (Baker & Tuttle 1972). Within tetranychines, closely associated duplex setae are present on the first two leg tarsi of the Tetranychini and Tenuipalpoidini but these setae are often absent or disassociated in the Eurytetranychini. In Tenuipalpoidini, seta D4 is in a marginal position on the body or absent; this seta is in a more typical, more medial position in Tetranychini. [AP80] Andrews, K. L., & S. L. Poe. 1980. 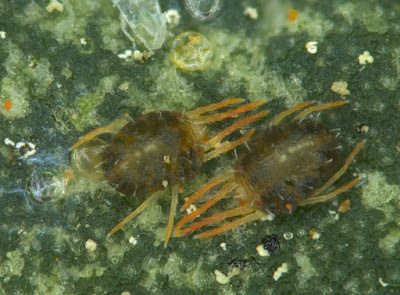 Spider mites of El Salvador, Central America (Acari: Tetranychidae). Florida Entomologist 63 (4): 502–505. [C-R02] Corpuz-Raros, L. A. 2002. Philippine acarine biological control agents: status, bioecology and research prospects. Philippine Agricultural Scientist 85 (2): 137–154. [GKO96] Gotoh, T., T. Kamoto & H. Oku. 1996. Termination of embryonic diapause by physical and chemical stimuli in the spider mite Panonychus bambusicola Ghora and Gotoh (Tetranychidae). In: Mitchell, R., D. J. Horn, G. R. Needham & W. C. Welbourn (eds) Acarology IX vol. 1. Proceedings pp. 667–669. Ohio Biological Survey: Columbus (Ohio). [G91] Gupta, S. K. 1991. The mites of agricultural importance in India with remarks on their economic status. In: Dusbábek, F., & V. Bukva (eds) Modern Acarology: Proceedings of the VIII International Congress of Acarology, held in České Budĕjovice, Czechoslovakia, 6–11 August 1990 vol. 1 pp. 509–522. SPB Academic Publishing: The Hague. [G01] Gupta, S. K. 2001. A conspectus of natural enemies of phytophagous mites and mites as potential biocontrol agents of agricultural pests in India. In: Halliday, R. B., D. E. Walter, H. C. Proctor, R. A. Norton & M. J. Colloff (eds) Acarology: Proceedings of the 10th International Congress pp. 484–497. CSIRO Publishing: Melbourne. [GB91] Gutierrez, J., H. R. Bolland, J. Etienne & D. Cotton. 1991. Deuterotoky in Mononychellus caribbeanae (Acari: Tetranychidae) on cassava in Guadeloupe. Karyotype and preliminary biological data. In: Dusbábek, F., & V. Bukva (eds) Modern Acarology: Proceedings of the VIII International Congress of Acarology, held in České Budĕjovice, Czechoslovakia, 6–11 August 1990 vol. 2 pp. 443–447. SPB Academic Publishing: The Hague. [H23] Hirst, S. 1923. On some new or little-known species of Acari. Proceedings of the Zoological Society of London 1923: 971–1000. [H07] Ho, C.-C. 2007. Crop mite pests of southeast Asia and tropical far east. In: Morales-Malacara, J. B., V. M. Behan-Pelletier, E. Ueckermann, T. M. Pérez, E. G. Estrada-Venegas & M. Badii (eds) Acarology XI: Proceedings of the International Congress pp. 259–266. Instituto de Biología and Faculdad de Ciencias, Universidad Nacional Autónoma de México, Sociedad Latinoamericana de Acarología: México. [MF07] Moraes, G. J. de, & C. H. W. Flechtmann. 2007. Phytophagous mites of tropical crops in eastern South America. In: Morales-Malacara, J. B., V. M. Behan-Pelletier, E. Ueckermann, T. M. Pérez, E. G. Estrada-Venegas & M. Badii (eds) Acarology XI: Proceedings of the International Congress pp. 279–288. Instituto de Biología and Faculdad de Ciencias, Universidad Nacional Autónoma de México, Sociedad Latinoamericana de Acarología: México. [NG96] Navajas, M., & J. Gutierrez. 1996. Molecular phylogeny in spider mites (Tetranychidae). In: Mitchell, R., D. J. Horn, G. R. Needham & W. C. Welbourn (eds) Acarology IX vol. 1. Proceedings pp. 305–308. Ohio Biological Survey: Columbus (Ohio). [QA91] Quintero, M. T., & H. A. Acevedo. 1991. Mites of fermented liquid foods in Mexico. In: Dusbábek, F., & V. Bukva (eds) Modern Acarology: Proceedings of the VIII International Congress of Acarology, held in České Budĕjovice, Czechoslovakia, 6–11 August 1990 vol. 1 pp. 611–614. SPB Academic Publishing: The Hague. [S91] Sabelis, M. W. 1991. Life-history evolution of spider mites. In: Schuster, R., & P. W. Murphy (eds) The Acari: Reproduction, development and life-history strategies pp. 23–49. Chapman & Hall: London. Last updated: 16 February 2019.